I picked “any book” because I have four or five lying around that I’ve been meaning to read. It took two 15 minute sessions, but I got the first three done. Hey, can’t win ’em all! I wasn’t distraction-free either since my daughter refuses to take naps. It was refreshing to have my homework completed before dinner time. I’m usually up late trying to get my thoughts together for those posts. Focusing on nothing but them for a period of time helped me to get them knocked out. Day 5 (Saturday)- De-clutter one area of your home. It can be a closet, cabinet, or drawer. I’ve followed several clutter related challenges from Crystal’s blog, Money Saving Mom, and they have helped me tremendously. Just ask my mom what my very first apartment (after getting married) looked like. I guess the older I get, the more open I am to getting rid of things I’ve had since high school or college. 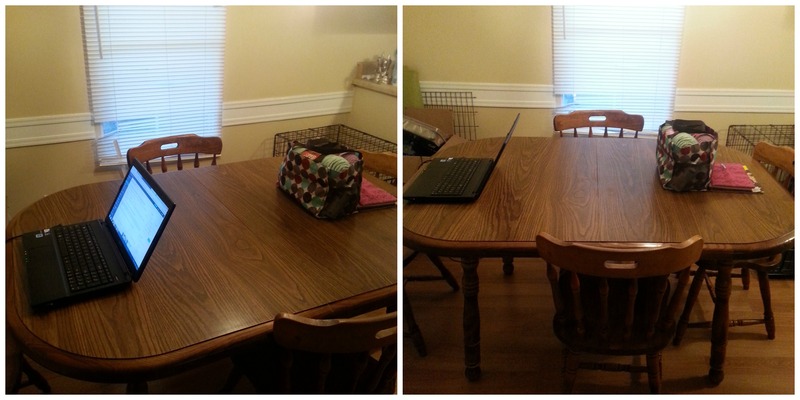 For this challenge, I had the perfect place in mind: the dining room table. I admit, we don’t eat at our table unless there is a gathering at our home. Since we had an early Thanksgiving on Sunday you’d think that my table would still be clear. HAH! You, my friend, are sorely mistaken. My messy table. I either need less stuff or a bigger house. I’m gonna go with option 2. I’m going to be honest; there aren’t many places to put stuff in our house. For a family of four with three dogs, our barely 1000 sq. ft. house just isn’t cutting it. Anyway, since I have company coming over for a crochet date (Hi, Erika!) I decided this was the area to tackle. My clean-ish table. 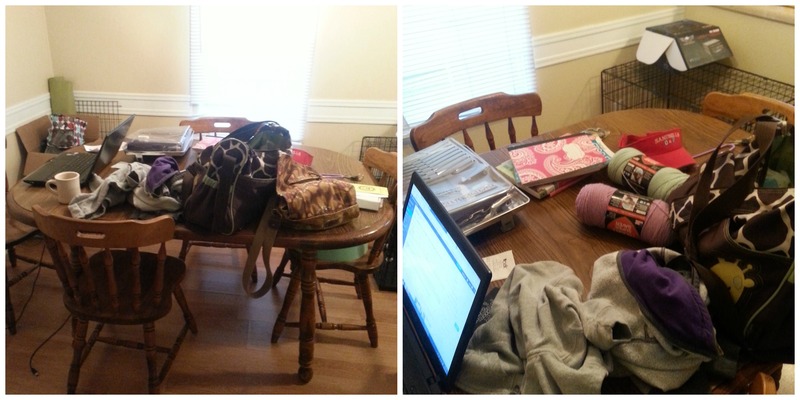 I don’t have a desk so I use the table as my work space (when I’m not on the couch). I also didn’t put my yarn bag away since I’ll be crocheting tonight. Y’all, it took me less than 15 minutes to put everything in its place and I feel so much better. It’s just a table, but it’s no longer in my line of sight and adding to my stress. Are you taking the 7-day challenge? I’d love to hear how you are doing! Comment below or send me a tweet!